The College of Nursing aspires to be a model of excellence, recognized nationally and internationally, for innovative education, dynamic programs of research, and creative approaches to practice. We are committed to preparing nurses for leadership as clinicians, scientists and educators who reflect and care for a diverse society; foster interdisciplinary collaboration; and improve the health of individuals, families and communities. As part of the University of Florida, the College of Nursing has all the resources of the state’s flagship university at their fingertips, including a top-notch interdisciplinary Health Science Center and centers and institutes like the Evelyn F. and William L. McKnight Brain Institute of UF , the UF Genetics Institute, the UF Health Cancer Center, and the UF Institute on Aging. The nursing education programs offered at UF address gaps in the health care system, as do the College’s innovations in technological resources and initiatives linking students to diverse and international populations. 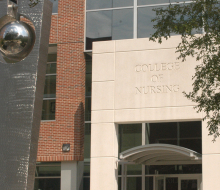 The College of Nursing has a history of pioneering leadership in nursing education, having offered Florida ‘s first nurse practitioner programs, and first PhD in Nursing Science program. Health care delivery networks associated with UF provide access to an integrated system of community hospitals and clinics, including statewide home health care, a major veterans’ health system and the Shands Healthcare system. Faculty members set a standard for excellence when it comes to innovative education, dynamic research and quality patient care.